Elbow dislocation is the most common dislocation in children; in adults, it is the second most common dislocation after that of the shoulder. [1, 2, 3, 4, 5] The elbow is amazingly stable, relying more on bony anatomy configuration for stability rather than ligaments. Considerable force is necessary to dislocate the elbow; sports activities account for up to 50% of elbow dislocations, and this type of injury is more commonly seen in adolescent and young adult populations (see the image below). Posterior and lateral dislocation of the left elbow in a soccer goalie. A small avulsion fracture of the olecranon is present. Posterior elbow dislocations comprise over 90% of elbow injuries. Early recognition of this injury is required due to the need for early reduction, given a higher likelihood for poor function and possible neurovascular compromise with delays in reduction. [1, 2, 3, 4, 6, 7] Associated fractures are not infrequent with elbow dislocations, given the force that is required to dislocate the elbow. Anterior dislocations are seen much less commonly than posterior dislocations. Divergent dislocations, which result in the ulna and radius dislocating in opposite directions, are even more rare. In the pediatric population, radial head subluxation is the main cause of elbow dislocations. For excellent patient education resources, visit eMedicineHealth's First Aid and Injuries Center. 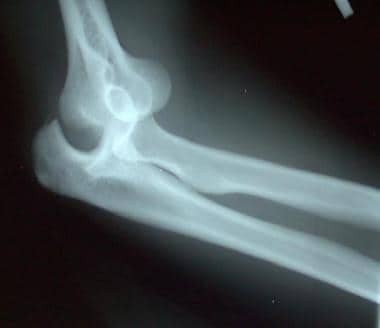 Also, see eMedicineHealth's patient education articles Elbow Dislocation and Broken Elbow. The rate of elbow dislocation is 6-13 cases per 100,000 people, and this injury occurs more frequently in males than in females. Of all elbow dislocations, 10-50% are sports related. More than 90% of elbow dislocations are posterior dislocations. The humerus and ulna form a very stable unit, which is generally resistant to disruption unless considerable force is applied. This inherent stability also reduces the likelihood of redislocation. The primary bony stabilizers are the coronoid and radial head. The medial collateral ligament (MCL) and lateral collateral ligament (LCL) comprise the ligamentous stability of the elbow and act as a back-up system to the elbow's natural bony stability. The MCL consists of 3 bands, the anterior oblique, posterior oblique, and the transverse. The anterior band provides most of the resistance to valgus stress. The LCL has 2 bands, the ulnar collateral and radial collateral. The ulnar nerve passes posteriorly to the medial epicondyle of the humerus, and then it travels deep in the forearm before becoming more superficial again at the wrist. The close proximity of the ulnar nerve to the medial epicondyle allows for the increased likelihood of entrapment when a dislocation occurs. The median nerve is also frequently affected and travels intimately with the brachial artery, which predisposes to simultaneous injury for both the artery and nerve. The posterior compartment contains the radial nerve and triceps brachii muscle. Anatomically, the mechanism for elbow dislocations is believed to occur as a continuum of damaged/torn structures, beginning laterally with the ulnar portion of the LCL, followed by complete LCL disruption, then damage to the anterior and posterior compartments. The posterior MCL can then become damaged, leaving the anterior portion intact. Further force can allow the elbow to pivot about the anterior bundle of the MCL, potentially damaging it. The LCL, therefore, is considered to be the initial weak link in elbow dislocations. In the pediatric population, the clinician should be aware of the 6 ossification centers of the elbow joint as well as the annular ligament. The capitellum, radial head, internal (medial) epicondyle, trochlea, olecranon, and external (lateral) epicondyle (CRITOE) is the order in which the ossification centers appear. These centers may often be mistaken for fractures on x-rays. NOTE: A general rule of thumb for the time of appearance of the ossification centers is "1-3-5-7-9-11," which are the ages in years, corresponding to the CRITOE mnemonic. In cases in which there is radial head subluxation, the radial head slips under the annular ligament and becomes trapped. Biomechanically, no single sport definitively increases the risk of elbow dislocations; however, sports that increase the likelihood of a person falling onto an outstretched hand (ie, FOOSH injury) (eg, gymnastics, rollerblading, cycling) may theoretically increase the risk of elbow dislocation. O'Driscoll SW. Elbow dislocations. Morrey BF, ed. The Elbow and Its Disorders. 3rd ed. Philadelphia, Pa: WB Saunders; 2000. 409-17. Rockwood CA Jr, Green DP, Bucholz RW, eds. Rockwood and Green's Fractures in Adults. 4th ed. Philadelphia, Pa: Lippincott Williams & Wilkins; 1996. 971-85. Ross G. Acute elbow dislocation: on-site treatment. Phys Sportsmed. Feb 1999. 27(2):121-2. [Medline]. [Full Text]. Parsons BO, Ramsey ML. Acute elbow dislocations in athletes. Clin Sports Med. 2010 Oct. 29(4):599-609. [Medline]. Sheps DM, Hildebrand KA, Boorman RS. Simple dislocations of the elbow: evaluation and treatment. Hand Clin. 2004 Nov. 20(4):389-404. [Medline]. Carter SJ, Germann CA, Dacus AA, Sweeney TW, Perron AD. Orthopedic pitfalls in the ED: neurovascular injury associated with posterior elbow dislocations. Am J Emerg Med. 2010 Oct. 28(8):960-5. [Medline]. Dizdarevic I, Low S, Currie DW, Comstock RD, Hammoud S, Atanda A Jr. Epidemiology of Elbow Dislocations in High School Athletes. Am J Sports Med. 2016 Jan. 44 (1):202-8. [Medline]. Nelson AJ, Izzi JA, Green A, Weiss AP, Akelman E. Traumatic nerve injuries about the elbow. Orthop Clin North Am. 1999 Jan. 30(1):91-4. [Medline]. Lee KS, Rosas HG, Craig JG. Musculoskeletal ultrasound: elbow imaging and procedures. Semin Musculoskelet Radiol. 2010 Sep. 14(4):449-60. [Medline]. Mehta JA, Bain GI. Elbow dislocations in adults and children. Clin Sports Med. 2004 Oct. 23(4):609-27, ix. [Medline]. Cohen MS, Hastings H 2nd. Acute elbow dislocation: evaluation and management. J Am Acad Orthop Surg. 1998 Jan-Feb. 6(1):15-23. [Medline]. Ross G, McDevitt ER, Chronister R, Ove PN. Treatment of simple elbow dislocation using an immediate motion protocol. Am J Sports Med. 1999 May-Jun. 27(3):308-11. [Medline]. Schippinger G, Seibert FJ, Steinböck J, Kucharczyk M. Management of simple elbow dislocations. Does the period of immobilization affect the eventual results?. Langenbecks Arch Surg. 1999 Jun. 384(3):294-7. [Medline]. Villarin LA Jr, Belk KE, Freid R. Emergency department evaluation and treatment of elbow and forearm injuries. Emerg Med Clin North Am. 1999 Nov. 17(4):843-58, vi. [Medline]. Macias CG, Bothner J, Wiebe R. A comparison of supination/flexion to hyperpronation in the reduction of radial head subluxations. Pediatrics. 1998 Jul. 102(1):e10. [Medline]. [Full Text]. Coulibaly NF, Moustapha NM, Djoumoi HH, Lamine S, Badara GA, Daniel SA. Management Of Recent Elbow Dislocations: Functional Treatment Versus Immobilization; A Prospective Study About 60 Cases. Open Orthop J. 2017. 11:452-459. [Medline]. Iordens GI, Van Lieshout EM, Schep NW, De Haan J, Tuinebreijer WE, Eygendaal D, et al. Early mobilisation versus plaster immobilisation of simple elbow dislocations: results of the FuncSiE multicentre randomised clinical trial. Br J Sports Med. 2017 Mar. 51 (6):531-538. [Medline]. Duckworth AD, Kulijdian A, McKee MD, Ring D. Residual subluxation of the elbow after dislocation or fracture-dislocation: treatment with active elbow exercises and avoidance of varus stress. J Shoulder Elbow Surg. 2008 Mar-Apr. 17(2):276-80. [Medline]. Micic I, Kim SY, Park IH, Kim PT, Jeon IH. Surgical management of unstable elbow dislocation without intra-articular fracture. Int Orthop. 2009 Aug. 33 (4):1141-7. [Medline]. Jeon IH, Kim SY, Kim PT. Primary ligament repair for elbow dislocation. Keio J Med. 2008 Jun. 57(2):99-104. [Medline]. [Full Text]. Duckworth AD, Ring D, Kulijdian A, McKee MD. Unstable elbow dislocations. J Shoulder Elbow Surg. 2008 Mar-Apr. 17(2):281-6. [Medline]. de Haan J, Schep NW, Zengerink I, van Buijtenen J, Tuinebreijer WE, den Hartog D. Dislocation of the elbow: a retrospective multicentre study of 86 patients. Open Orthop J. 2010 Feb 17. 4:76-9. [Medline]. [Full Text]. Kesmezacar H, Sarikaya IA. The results of conservatively treated simple elbow dislocations. Acta Orthop Traumatol Turc. 2010. 44(3):199-205. [Medline]. Burra G, Andrews JR. Acute shoulder and elbow dislocations in the athlete. Orthop Clin North Am. 2002 Jul. 33(3):479-95. [Medline]. Englert C, Zellner J, Koller M, Nerlich M, Lenich A. Elbow dislocations: a review ranging from soft tissue injuries to complex elbow fracture dislocations. Adv Orthop. 2013. 2013:951397. [Medline]. Sano S, Rokkaku T, Imai K, Saito S, Abe Y, Moriya H. Radial head dislocation with ulnar plastic deformation in children: an osteotomy within the middle third of the ulna. J Shoulder Elbow Surg. 2008 Sep-Oct. 17 (5):768-71. [Medline]. Schreiber JJ, Potter HG, Warren RF, Hotchkiss RN, Daluiski A. Magnetic resonance imaging findings in acute elbow dislocation: insight into mechanism. J Hand Surg Am. 2014 Feb. 39(2):199-205. [Medline]. Bruinsma WE, Guitton T, Ring D. Radiographic loss of contact between radial head fracture fragments is moderately reliable. Clin Orthop Relat Res. 2014 Jul. 472(7):2113-9. [Medline]. [Full Text]. Sormaala MJ, Sormaala A, Mattila VM, Koskinen SK. MDCT findings after elbow dislocation: a retrospective study of 140 patients. Skeletal Radiol. 2014 Apr. 43 (4):507-12. [Medline]. The preferred method for posterior elbow dislocation reduction is to lay the patient prone with the humerus supported by the exam table. Place one hand around the wrist of the affected arm and apply downward traction, while the other hand stabilizes the humerus and the thumb is placed over the olecranon, with gentle pressure applied to facilitate reduction.